What is the cost of services provided by SJDC? Although rates vary depending upon the type of service required, SJDC generally charges $250/hr for digital forensic services. Click here for a full description of our rates and terms. How long does it take to complete digital forensics analysis? Generally, a basic request for an computer analysis (recover e-mail, a specific document, etc) requires a minimum of ten billable hours (imaging, analysis, verification, duplication, documentation, etc). Broader requests that involve extensive research (searches for less specific evidence) are likely to exceed 20 hours. E-discovery requires a significant amount of time, which is generally difficult to estimate in advance. While each case is different, SJDC can provide a rough estimate of the amount of time expected for the request during the initial consultation. A basic request for a cell phone analysis and recovery of first level data (includes deleted data) requires about 4 billable hours for most phones. In most cases the recovery of first level data is sufficient. Broader requests that involve extensive research are likely to exceed 15 hours. What is the likelihood of recovering deleted text messages? Successful recovery of pertinent messages depends on a number of factors, including the amount of time and/or device usage (amount of texting) since deletion. Generally, if the device has been used frequently since message deletion, the majority of text messages recovered were usually deleted within the last few months before the device is received for analysis. This is not always the case and we often recover text messages that were deleted years before the device is received for analysis. Other factors to consider include; the amount of stored data relative to the capacity of the device, whether the device has been factory reset, and/or the use of additional steps (e.g., third party applications) to assist with permanent deletion. That said, we almost always recover deleted text messages, but they may not be the text messages of interest. If the device is an iPhone that was connected to a computer with iTunes, there is a good chance of recovering more dated deleted messages from the computer. If this is the case, give us a call so we can help determine the likelihood of recovery. Do I have to send my phone for SJDC to recover data (text messages, contacts, call logs, etc)? Yes. We will need you to send or deliver your phone in order for us to recover your data. We can provide insight regarding the recovery of your data from other sources, but our primary service is forensic analysis and data recovery from physical devices. In most cases, deleted data is not available from sources other than the device itself. We will do our best to minimize the amount of time that you do not have your phone. What services does SJDC provide? Do I really need a digital forensics professional? We are often asked about the use of a personally known computer guru or an IT professional to recover data of interest in litigation. Many times these individuals can get the data of interest. However, the admissibility of the data/evidence can be challenged when these individuals fail to use court and industry accepted techniques to recover and introduce the data as evidence. Don’t risk your case on the assumptions of an IT professional who is not well-trained in (and does not regularly practice) digital forensics. 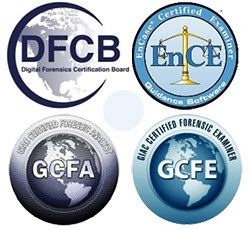 SJDC maintains certifications, years of training, education, and experience in many aspects of digital forensics. In a word, experience. You should only trust the admissibility of your evidence to someone who has the experience to handle the request properly, from acquisition through testimony. Some “experts” have the technical expertise to recover your data, but lack credentials and experience with evidence handling, legal procedures, testimony, and industry standard processes with regard to digital forensics. SJDC brings with it 20 years of law enforcement experience, graduate degrees in the administration of justice, digital forensic certifications, and years of applicable training and experience in digital forensics. Would SJDC refuse my case? Oftentimes cases are referred by SJDC to other reputable DFP’s because of potential conflicts of interest. SJDC will, as a regular practice, explore the possibility of conflicts of interest with your case. Has the DFP worked with/for opposing counsel/litigants on this case? Does the DFP have an interest in the matter that might create bias? Does the DFP have a relationship with any parties interested in the outcome of the case? Would acceptance of the case create an ethical challenge for the DFP? If you think there may be a potential conflict of interest, give us a call so we can discuss the concern and (if needed) look at other options to facilitate your need. What assurances do I have if SJDC is retained? Security– your data/evidence will be duplicated, then securely stored to ensure admissibility and avoid contamination. All analyses will be conducted within the forensic copies of the evidence. Professionalism – SJDC maintains the highest professional standards. Clients are assured ethical, unbiased, and competent representation. Confidentiality – SJDC will only disclose case and evidentiary details as requested by the client or as compelled by legal process. Competency – SJDC will recover and analyze case data and communicate findings in a clear and effective manner. We will provide technical details when necessary, while explaining procedures, limitations and conclusions with little technical jargon. Given our years of training, education, and experience, clients can be assured exceptional representation for their digital forensic needs. Our principal consultant, Michael Antal, PhD, is a certified forensic examiner and has years of training, education, and experience in most aspects of digital forensics, training and research. Dr. Antal belongs to several professional organizations and regularly attends training to maintain proficiency and be attuned to advances in the field. For more information regarding our credentials, download a copy of Dr. Antal’s vitae. How Do I Contact SJDC?